Pastoral demands form only a minor portion of municipal demands. However, also pastoral demands are based on assumed population numbers. Thus, the unit "l/capita/day" refers to human and NOT to livestock population. Although look-up table WATER_USE_BILL_CAT shows the billing categories "Cattle Farm, Poultry" and "Vegetables Market, Live Stock Market", pastoral demands are not properly queried for historic demands. In case there is a strong seasonal variation and you are knowing its pattern you have the possibility to enter monthly data. Attention: If you entered yearly data first, the same figure will be entered for all months. This facilitates data entry. However, if you enter yearly data after the monthly data, all monthly data will be overwritten! 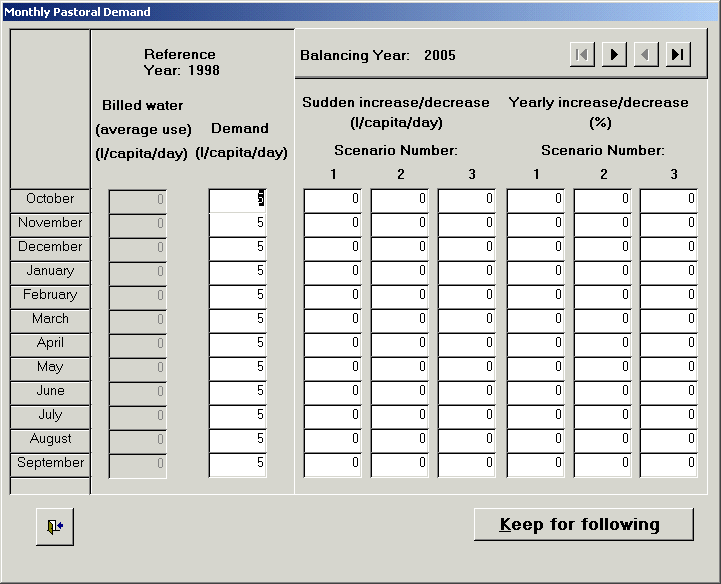 Demand (l/capita/day) Pastoral water consumption per capita and day for the reference year. The billed monthly amounts of water for that year are generally shown as zero, but can be edited individually. Yearly increase/decrease (%) E.g. due to general trends in the local pastoral sector. For entry of Yearly increase/decrease ,the button Keep for Following is greatly facilitating data entry. The same value will be written to all following years. However, editing of the later years is always possible. Use the top bar to navigate between the individual time steps.